Why aren't there more films and videos of real bigfoots? The Bob Titmus collection of tracks, papers and memoribilia, along with other pieces of northern California bigfoot history, are on permanent display at the Willow Creek - China Flat Museum (in Willow Creek, California). The collection includes the original track casts from the Patterson film site in nearby Bluff Creek. This web site will not list the various clips that are known to be fake. There are several. It should be no surprise that some people will attempt to create bogus clips. The pertinent clips are those that may be authentic. 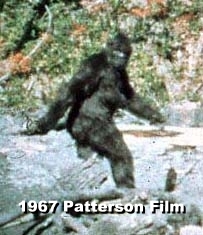 The 1967 Patterson-Gimlin footage -- also known as "the PGF," among bigfoot afficionados -- Obtained in 1967 during a bigfoot hunt in Northern California. The PGF has been included in a few different documentaries over the years. There have been several short "In Search Of" type programs that have used blurry, degraded copies of the PGF in their compulsory bigfoot/sasquatch episodes. The DVD version of the documentary "Sasquatch: Legend Meets Science" contains the entire footage -- the clearest version available. The documentary "Sasquatch: Legend Meets Science" is the most up-to-date documentary about scientific evidence and video footage. This documentary covers the shift in attitudes among the scientific community in recent years, and records the examination of the Skookum cast by three well known primate experts, including Dr. Daris Swindler -- considered to be the top primate anatomy expert in the U.S. The 1970's feature film documentary "The Mysterious Monsters" also includes the PGF. The Mysterious Monsters was an augmented remake of a popular 70's TV documentary, "David C. Wolper Presents: Legendary Creatures". It had a sucessful cinema run in the early 70's. It was never released commercially on video. 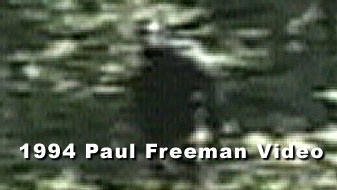 The Paul Freeman footage was filmed in Blue Mountains region near the Washington/Oregon border. In the beginning of the clip, Paul is following a line of tracks into a grove of trees where an large animal is seen moving away from him. Paul Freeman (now deceased) worked for the local watershed district when he had his first encounter in a restricted forest area. He was ridiculed after first sighting, but then began to carry a camera with him. So far no one has shown a side-by-side comparison, with the Freeman footage on one side, and a human wearing a similar "costume" next it. As with the Patterson figure, it is not easy to duplicate the Freeman figure. Paul Freeman was a man of small means. He would not have been able to construct a Hollywood-caliber "costume". This footage is also contained in the documentary, Sasquatch: Legend Meets Science. 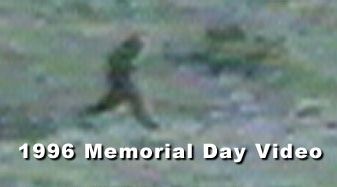 The "Memorial Day footage" was shot by Lori and Owen Pate in 1996, at Chopaka Lake in north central Washington State (click here for map). Multiple witnessed observed this figure cross the hillside as Lori videotaped it. This is the third clip analyzed in Sasquatch: Legend Meets Science Several minutes of the progam is dedicated to a forensic reconstruction of this figure and its movement across the hillside. The 1970's feature documentary "The Legend of Boggy Creek." -- the first, and most widely recognized documentary title. This documentary contains no actual footage like the PGF. All scenes are re-enactments depicting local incidents from the Arkansas-Texas border area.